I mean… what else would cause me to drop repeatedly below 70 mg/dl all morning… after consuming 4 cups of juice, my stand-by breakfast, coffee, a fake Twinkle (redundant much?) and a plate full of pasta? Guess my July stress madness is over. Or I’m finally… wait… no. Not gonna jinx it. Oh – and this is completely accurate if you haven’t seen it. Released on my birthday! Basal checks! I’m in desperate need of forcing myself to do them. I can’t seem to eat dinner early enough though. Apparently, I also need to adjust my carb ratios too, as I can’t seem to start a basal test without plummeting two hours post meal. Ditto, and thanks for the reminder on basal checks. In related news, I’ve been consistently going low post-breakfast recently (when before, I would ALWAYS spike high.) 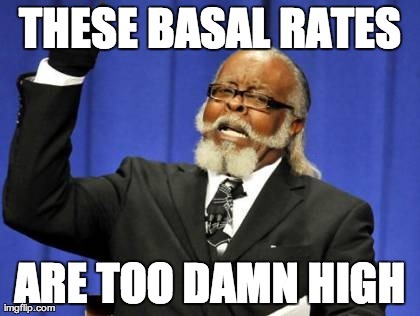 Freaking basal rates!! Or – life in general. Such a clusterf***. Aww, I hear you! I did so much basal testing back in March and April and I thought I had things going well, but now in August I have been pretty high and I can’t figure out why other than basal rates 😦 I don’t want to test again though!